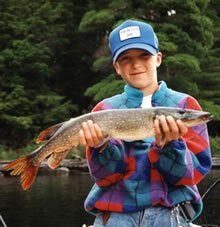 Smoky Lake is a clear, rocky lake with great multi-species fishing. Although smallmouth bass dominate this fishery, there is also good largemouth bass and northern pike fishing. From Smoky Lake there is easy access to a number of other great fishing lakes, including Noganosh Lake, Last Lake, Mud Lake, Clear Bay, and John Lake where smallmouth & largemouth bass and northern pike abound. If that weren’t enough water to explore and fish, there are also a number of walk-in back lakes with exceptional largemouth & smallmouth bass fishing nearby, including Donnas Lake, Livewire Lake, Lost Lake, and Doe Lake. Over the course of a day, fishing conditions gradually change, and anglers must change locations, presentations and baits accordingly. Typically, early morning finds fish in shallow water, generally aggressive and feeding. This is a good time for casting spinnerbaits, rattlebaits, spinners, spoons and topwater lures (buzzbaits, poppers, twitchbaits). Cover lots of water, especially near weeds, timber, beaver lodges and shoals. As skies brighten, fish move into cover or into deeper water. To fish effectively, slow down. Fish cover methodically, patiently with a plastic worm or flippin’ jig. Work a twistertail jig in deeper water, down the sides of shoals, or parallel to weedlines and dropoffs. For bass, try working a plastic lizard or craw along the bottom using a Carolina rig. Deep diving crankbaits in natural finishes (perch, craw & minnnow) are especially effective at Smoky Lake. In the evening, or if skies cloud over, go back to fishing as you did early in the day – that is, using casting approaches.